Beekeeping has been around for many centuries. Throughout its long history, humans have learned to improve their methods and processes. Ancient beekeepers used tools to gather honey from beehives, and evidences prove that early humans also used smoke to subdue the bees. The art and science of beekeeping have come a long way, and changes in technology improved the methodology of culturing bees and producing honey. Tools are important parts of every industry including beekeeping. There’s a tool in every beekeeping process. You need a certain tool when you’re starting up, a tool to create a colony, you need a tool to take care of the bees; another tool to examine the colony; you need a tool to extract the honey. And when it comes to honey extraction, several steps are needed to be strictly followed to ensure that you’re getting the best results. Before a beekeeper gets to extract the honey, the uncapping process should take place. This process is done by removing the beeswax that covers the honey frames. It’s actually a delicate procedure that requires the help of a specialized equipment such as the uncapping needle roller or the honey uncapping knife. In principle, the uncapping needle roller removes the beeswax like an electric knife. The difference is that using an uncapping needle roller eliminates the risk of accidental skin burns and it works faster compared to the electric knife. Aside from that fact, the uncapping needle roller reduces the damages on the frames during the process. This list covers the best uncapping needle rollers on the market. Looking for one may take some of your time, so we narrowed it down for you. Extracting honey could be a messy process. The Yosoo Uncapping Needle Roller reduces the mess during uncapping. It makes uncapping a lot faster saving you a lot of time. Materials used for this product includes wood for the handle, metal for the arm, and ABS plastic for the main roller. Uncapping has ever been this easy with the Yosoo Uncapping Needle Roller. It’s just you’re painting a wall. It’s easy to use and easy to clean. This uncapping needle roller measures 12 x 8 x 1.6 inches. It is lightweight weighing only 8 ounces, so you won’t have to worry about straining your hands even after hours of uncapping. It is also very affordable. Many beekeepers love this tool. You should add it on your beekeeping equipment. It is just of the few small things that makes life easier. The Ymkf Sqqr Uncapping Needle Roller is a sure bargain. It easily removes beeswax with just a few passes with damaging the frames. The needles on this equipment ensures proper uncapping. These needles pierce the capping easily and evenly. This product is made of the following materials: oak wood for the handle, metal for the arm, and plastic for the head. The handle is comfortable to the grip and the metal arm is sturdy enough to withstand continuous usage. It works like a paint roller that rolls evenly on a flat surface. This uncapping needle roller makes the uncapping process an easy task which in turn speeds up the entire process of honey extraction. It requires minimal effort to work with. It is also easy to clean like an ordinary kitchen utensil. The Ymkf Sqqr Uncapping Needle Roller measures 13 x 5 x 2 inches and weighs 8.8 ounces. 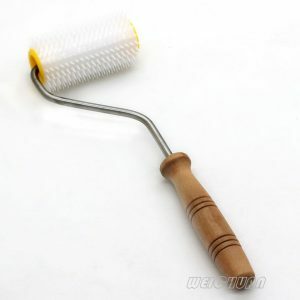 Many beekeepers have experienced the convenience brought by the Thaoya Uncapping Needle Roller. It’s an amazing tool that does its job well. You won’t lose honey during extraction thanks to its effective design. It features a smooth 5.1-inch wooden handle that is comfortable to the hands, a sturdy metal arm, and a head made from high-quality plastic. The plastic needles pierce the capping with just a small amount of pressure. The Thaoya Uncapping Needle Roller measures 9.6 x 3.7 x 3 inches (dimensions). It is also a lightweight tool that weighs 8.3 ounces. This uncapping needle roller is one of the most recommended uncapping tools on the market. It is affordable priced and works effectively every time. If you stumble upon a Thaoya Uncapping Needle Roller, don’t hesitate. Get it and you won’t have to use another uncapping needle tool for a very long time. Here’s another worthy extracting tool that you will love. 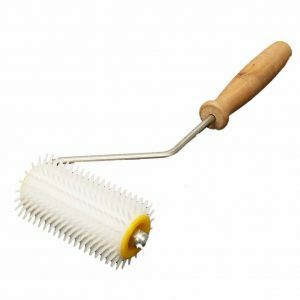 The Bettal Beekeeping Uncapping Needle Roller is one of the best products available on the market today. 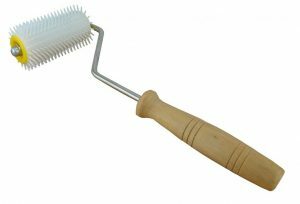 Many beekeepers recommend this simple tool for its effective performance during the extraction process. 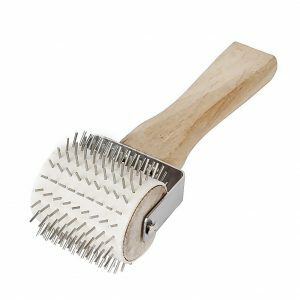 It features a smooth hardwood handle which is comfortable to the hands and a stainless head with stainless steel needles that pierce capping easily like hot knife on butter. This tool is 100% brand new and features high-quality construction. The needle length measures about 0.9 cm or 0.35 inch. The wood handle measures 15 centimeters or 5.9 inches in length and 3.5 centimeters or 1.38 inches in width. The roller measures about 6 centimeters in width and approximately 5 centimeters or 1.97 inches in diameter. This tool weighs 9 ounces, so it’s a lightweight tool that won’t strain your wrist and fingers while uncapping. It is also one of the most affordable uncapping needle rollers on the market. If you’re tired of using electric knives during the extraction process, maybe it’s time for you to switch to the uncapping needle roller. The uncapping needle roller performs better than your old tool and it will cut your uncapping time in half, maybe more. An uncapping needle roller will keep your frames intact and it won’t burn your skin like the electric knife. In short, it’s an excellent alternative that will make your beekeeping life easy. Let the Ascend Tools Uncapping Needle Stainless Steel Roller give you the experience. It’s a nice piece of equipment that will give outstanding results. The stainless steel needles will pierce the capping with so much ease that you won’t recall putting pressure on it. It’s so easy to use that it’s like painting a wall with a paint roller. This uncapping needle roller is made from high-quality materials that gives this tool its durability. You can also use this tool for loosening small amounts of heather honey. The roller measures approximately 6 centimeters in width and approximately 5 centimeters in diameter. The wood handle measures approximately 15.3 centimeters in length. The stainless steel needle measures approximately 1 centimeter. This uncapping needle roller is also an priced a bit higher than some of the items on this list but it gives great value for money. Uncapping using an electric knife stresses you? Why suffer when you can use an effective tool that will shorten the process without the annoying stress? Use the Weichuan Plastic Uncapping Needle Roller and forget about tiring yourself during the process. 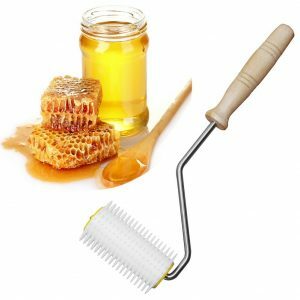 With this tool, you can have lots of fun while extracting honey – your hard-earned prize. This uncapping needle roller is made of high-quality materials. It features a detachable roller for easy cleaning and storage. The sharp plastic prongs or needles perfectly pierce the capping with ease. The arm is made of sturdy metal. The handle is made of high-strength plastic which is comfortable to the hands, with or without the gloves. This product has the dimensions of 10 x 4.9 x 2.5 inches. It weighs 10.4 ounces. This uncapping needle roller is also an affordable equipment. 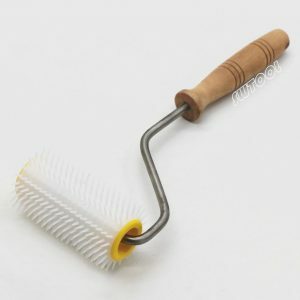 The Weichuan Plastic Uncapping Needle Roller will definitely make your beekeeping activities lighter. Beekeeping is already a demanding activity. Make it simple and enjoyable with this wonderful product. You’re probably looking for a cheap uncapping needle roller, but you don’t want to sacrifice performance over the price. Well, good news for you. The SWTool Plastic Uncapping Needle Roller with Wooden Handle is an affordable tool that can deliver excellent performance. It is very affordable, but this doesn’t mean that this tool is a push over. This uncapping needle tool makes the job done with lots of ease. It will not damage the frames because you just need to apply a small pressure to remove the beeswax effectively and evenly. This uncapping needle roller is made of high-quality materials that include wood, metal, and plastic. This combination of materials ensures that the equipment retains superb durability and functionality. The SWTool Plastic Uncapping Needle Roller with Wooden Handle has the packaging dimensions of 14 x 4 x 2 inches. It weighs only 1 pound. The Kocome Uncapping Needle Roller is another uncapping tool that you will enjoy to use. 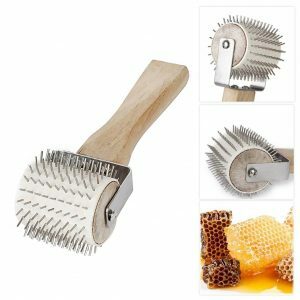 Many beekeepers recommend this simple tool for its effective performance during the extraction process. It features a smooth hardwood handle which is comfortable to the hands and a stainless head with stainless steel needles that pierce capping easily. It is made of high-quality materials proven to withstand continuous usage. This tool is 100% brand new and features high-quality construction. The needle length measures about 0.9 cm or 0.35 inch. The wood handle measures 15 centimeters or 5.9 inches in length and 3.5 centimeters or 1.38 inches in width. The roller measures about 6 centimeters in width and approximately 5 centimeters or 1.97 inches in diameter. This tool weighs 9 ounces, so it’s a lightweight tool that won’t strain your wrist and fingers while uncapping. The Kocome Uncapping Needle Roller is affordably priced and provides great value for money. One of the best uncapping needle rollers on the market today is the Amrka Uncapping Needle Roller. It’s one of the best because it is and affordable equipment that can get the job done easily and effectively. It features relatively dense prongs or needles that pierce the capping with ease. It also provides convenience while extracting propolis in honey combs. This tool features detachable parts for easy cleaning and storage. The handle is made of wood for comfort and stability, the arm is made of durable steel, and the roller is made of ABS plastic. On specifications, the roller measures approximately 3.5 centimeters or 1.37 inches in diameter and approximately 9.9 centimeters or 3.89 inches in width. The needle measures approximately 0.9 cm or 0.35 inch. The wood handle measures approximately 13.5 centimeters or 5.3 inches in length. This uncapping needle roller has a total length of 32 centimeters or 12.6 inches. 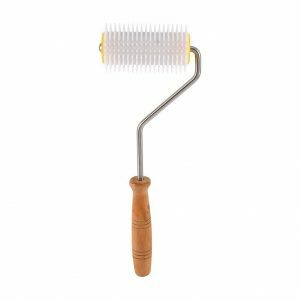 When searching for a high-quality extracting tool, look for a brand that is popular for providing exquisite beekeeping tools. One good example is the SODIAL Uncapping Needle Roller. It’s a 100% brand new tool that boasts in quality. 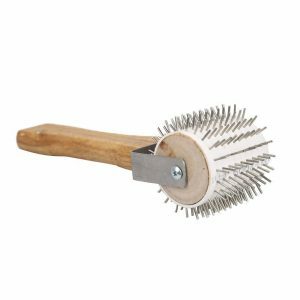 It features a hardwood handle which is comfortable to the hand, with or without the gloves and a stainless steel needle roller. The smooth handle offers excellent grip to avoid accidental slips. 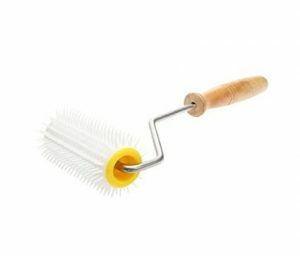 The roller allows effective and safe removal of beeswax on the frames. The roller measures approximately 5 centimeters in diameter and approximately 6 centimeters in width. The wood handle measures approximately 15.3 centimeters in length. The needle measures approximately 1 centimeter in length. Here are the best uncapping needle rollers on the market right now. Each product on this list provides effective and easy uncapping of beeswax on the frames. These tools are also among the most affordable tools that offer excellent performance. Save yourself some precious time through the use of these uncapping needle rollers. Every one of them is worth every penny and provides great value for money. Do you own any of the uncapping needle rollers on this list? Which needle roller(s) do you think should be added to this list? Leave a comment below and let us know.